The gift of time may be measured by increment and achievement. Rarely is an historian allowed to reflect upon their own works from the vantage point of 25 years beyond the initial publication. This volume, JFK and Vietnam, second edition, represents the continuation of Dr. John M. Newman's research, progress in his understanding and perceptions, and the fascinating sequence of events that unfolded following publication in 1992. This edition is the culmination of a rich tapestry of extraordinary developments which include the author's access to previously unavailable subjects and materials, analysis of newly released government documents, and the consequential relationship that was formed between Dr. Newman and former Secretary of Defense, Robert S. McNamara following the book's debut. JFK and Vietnam received high praise from Kirkus Reviews and Publisher's Weekly. It was favorably reviewed by Arthur Schlesinger, Jr. in the New York Times Book Review. Elsewhere the book caused a media firestorm with proponents of conflicting views making absolute declarations in opposition to Dr. Newman's basic thesis: Kennedy was opposed to committing U.S. combat forces to the war in Vietnam and was withdrawing the U.S. advisors at the time of his assassination in November 1963. The president’s position led those favoring intervention to concoct a story of battlefield success to prevent a complete withdrawal from Vietnam. Dr. Newman’s research detailed the accounts and admission of officers who had never before spoken for the record about the false representations of Viet Cong troop statistics and performance on the battlefield. Kennedy ordered Defense Secretary McNamara to use that myth of success to justify the withdrawal that began in the fall of 1963. An intense struggle erupted in the administration over the president’s decision to withdraw. Newman reveals how Kennedy tried to avoid publicly endorsing the fiction of success, and how his opponents quickly pivoted to telling the truth about the failing war effort in the days before the president’s tragic murder in Dallas. JFK and Vietnam uses incontrovertible documentary evidence to prove the reversal of Kennedy’s withdrawal plan by President Johnson, who ordered key changes be made to a National Security Action Memorandum (NSAM 273) two days after the assassination. Those changes opened the door to the direct use of conventional American military forces in Vietnam. In its original form, JFK and Vietnam was a landmark work that illuminated the false calculations, mistakes, manipulations, deceptions and intrigue which led to the Vietnam War. A quarter century later, JFK and Vietnam, second edition, expands upon and adds to what so powerfully defined its original impact. The publication of JFK and Vietnam in 1992 did more than create controversy and ignite a media firestorm. Its basic thesis that President Kennedy was opposed to sending U.S. combat forces to Vietnam and would have averted the terrible war and its consequences was denounced by some and applauded by others. The book was given sufficient thoughtful attention by a few which would change the nature and scope of the argument over what would he have done if he had lived. While being attacked (and defended) during the initial period following publication, it was singled-out and praised by former DCI William Colby and former special assistant to President Kennedy, Arthur Schlesinger, Jr., adding credibility to the idea that up until that time the story had never been presented with such detail, authority, or documentation. In 1992, JFK and Vietnam received high praise from Publisher's Weekly and Kirkus Reviews. It was featured and recommended on the front page of the New York Times Book Review. The book garnered nation-wide attention. For a time. That time was cut short by the demonstrable suppression of the book by its publisher, Warner Books. After first surviving a very serious threat of intervention to block publication by a federal agency, within five months JFK and Vietnam was pulled from the shelves, found to be unavailable for purchase anywhere, and left its author unable to communicate with the publisher’s representatives. They stopped returning his calls. Not since the Pentagon Papers had there been such an attempt to deny the American public access to a book about Vietnam. Without a serendipitous encounter between the author and a distinguished member of a distinguished American family, the story of the book itself might well have ended as abruptly as it began. It is our very good fortune that the story did not end there: the publisher returned the legal rights of the book to its author, and 25 years later we have JFK and Vietnam, second edition. 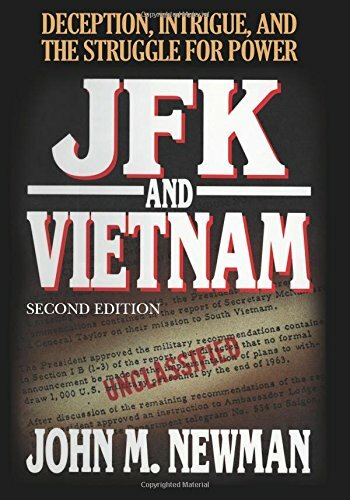 JFK and Vietnam, second edition, should be publicized and promoted so that every student, every teacher, every citizen who volunteers for military service, and every aspiring politician will know the many false calculations, mistakes, manipulations, deceptions and intrigue which led to the Vietnam War. This essential work examines in detail the Shakespearean machinations of deception and counter-deception that took shape in the hidden maneuverings of a president who was determined to avoid being trapped and determined to never again repeat the mistakes of the Bay of Pigs. Dr. Newman documents President Kennedy’s navigation of a dangerous course through Cold War hot spots and a very divided administration. What eventually emerges is an astonishingly dishonorable deception: a deliberate attempt to manipulate the President of the United States to authorize a war policy to which he was fundamentally opposed. This is more than JFK and Vietnam. It is JFK and Laos; JFK and the Pentagon; JFK and the CIA; JFK and the National Security establishment as it evolved during the years preceding his election. The president recognized and responded to a clever adversary during the two years, ten months and two days of his administration, which acted—within 48 hours of his violent death in Dallas—to reverse his policy on Vietnam and throw America headlong into the tragic war that ensued. Dr. John Newman is a retired U.S. Army intelligence officer who served for two years as Executive Military Assistant to the Director, General William Odom at the National Security Agency. He has testified before various sub-committees of the U.S. House of Representatives, has worked as a consultant on two major motion pictures and to various U.S. and foreign media organizations including PBS Frontline, the History Channel, C-Span, NBC, and other news agencies. His experience and expertise as a strategic intelligence cryptologic analyst makes his qualifications and credentials unique among those who choose to delve into the hidden histories buried within America’s military and intelligence bureaucracies. For the past quarter century his work has overturned orthodoxies, broken new ground, introduced new facts, and produced revelations about America during the Cold War.